Good lighting has the power to transform any kitchen. While we often prioritise aspects like the colour scheme, appliances and furnishings, it’s key that lighting is not forgotten. Carefully thought-out lighting solutions can enhance the textures and colours used in your kitchen and create a brighter, more enjoyable space in which to cook and entertain. Take natural light into account when planning; which part of the room is naturally darkest? So – have we piqued your interest? Lighting is space enhancing and can make all rooms feel bigger. So if your kitchen or dining area is small, why not increase the sense of space by using directional spotlights angled towards the cupboards and walls? This way, the light will be reflected back into the room creating the feeling of a larger space. Who says the dining space and the preparation space needs to feel the same? By using different types of lighting to zone your kitchen you’ll be able to clearly mark the function of each space. For example, spotlights in spaces where bright light is crucial and mood lighting in the rest of the space. While we usually think of lighting as functional, it can also provide a decorative purpose. For example, if you install lighting into a glass-fronted cabinet, or behind open shelving, it will add a touch of the wow-factor. Work with your room. Plan your kitchen lighting around the amount of natural daylight the room receives and whether it’s south or north facing. These are very important aspects to consider and will ensure that you get the levels of lighting just right. Consider LED under cupboard lighting. This not only ensures great visibility – useful during food preparation – the latest LED’s also have less heat output, saving you money and preventing cupboards and their contents becoming too warm. Opt for layered lighting. If you want your kitchen to have real ambience, layering the lighting is a must. It helps you go from a bright and productive working atmosphere to relaxed dinner date feel with just a flick of a switch. Consider spotlights in places you need the light – such as food preparation areas. Selecting directional versions also gives you added flexibility. If you’re planning on upgrading your kitchen lighting, always remember to use a qualified electrician for advice. 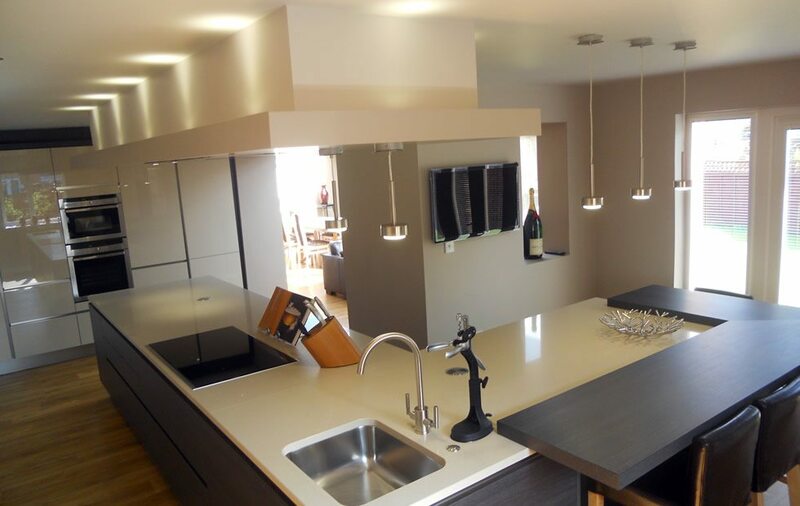 Alternatively, you can get in contact with us here at Kitchen Design Centre and see how we can revamp your kitchen’s style – with new furnishings, appliances and fantastic lighting. Visit us at one of our showrooms to see our fabulous kitchen displays. We look forward to seeing you!